Hand lotions and hand creams may be described as moisturizing creams that help keep the skin on the hands soft, smooth, supple, and hydrated. Some such creams may contain sunblock components. Hand Lotion Poisoning is the accidental or intentional intake (consumption) of hand creams and lotions. What is Hand Lotion Poisoning? Some lotions and creams (used for face and neck, hands, and legs) are medicated and used for skin conditions that include rashes, allergies, acne, eczema, fungal infections such as athlete’s foot, etc. What are the Causes of Hand Lotion Poisoning? What are the Signs and Symptoms of Hand Lotion Poisoning? How is First Aid administered for Hand Lotion Poisoning? Generally, Hand Lotion Poisoning is a non-serious condition. With appropriate and adequate home care, the individual may recover completely, without any severe symptoms being noted. Who should administer First Aid for Hand Lotion Poisoning? 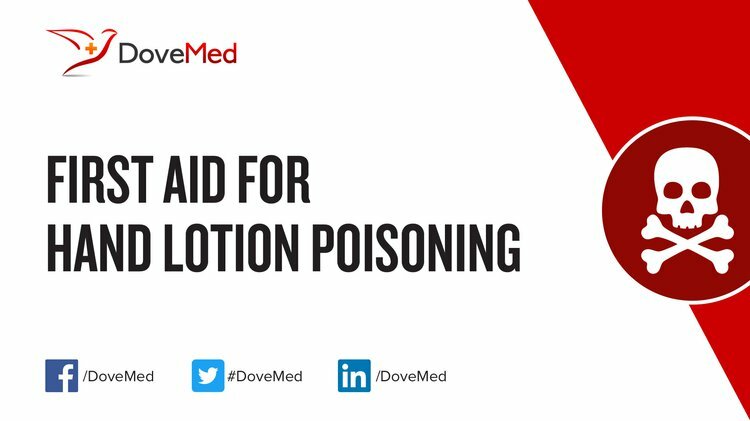 First aid for Hand Lotion Poisoning is administered by healthcare professionals. What is the Prognosis of Hand Lotion Poisoning? How can Hand Lotion Poisoning be Prevented? Yanagihara, A. A., Wilcox, C., King, R., Hurwitz, K., & Castelfranco, A. M. (2016). Experimental assays to assess the efficacy of vinegar and other topical first-aid approaches on cubozoan (Alatina alata) tentacle firing and venom toxicity. Toxins, 8(1), 19. Canham, L. (2011). The first step in infection control is hand hygiene. Dental assistant (Chicago, Ill.: 1994), 80(1), 42-46. American Academy of Orthopaedic Surgeons. (2013). Wilderness First Aid: Emergency Care in Remote Locations. Jones & Bartlett Publishers. Ren, Z., Zhu, K., Kang, H., Lu, M., Qu, Z., Lu, L., ... & Wang, X. (2015). Randomized controlled trial of the prophylactic effect of urea-based cream on sorafenib-associated hand-foot skin reactions in patients with advanced hepatocellular carcinoma. Journal of Clinical Oncology, 33(8), 894-900. Bennett, D. H., Ritz, B., Cassady, D. L., Lee, K., & Hertz-Picciotto, I. (2010). Usage pattern of personal care products in California households. Food and chemical toxicology, 48(11), 3109-3119. Chouhan, A. (2011). First Aid Treatments of Some Common Problems and Diseases. International Journal of Pharmaceutical & Biological Archive, 2(5). Guo, Y., Wang, L., & Kannan, K. (2014). Phthalates and parabens in personal care products from China: concentrations and human exposure. Archives of environmental contamination and toxicology, 66(1), 113-119.